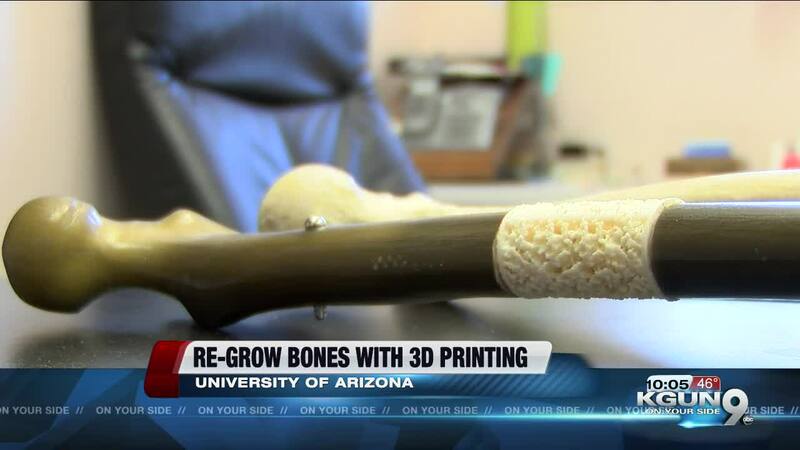 TUCSON, Ariz. — Researchers at the University of Arizona believe they've found a new way to re-grow broken bones. With a recent $2.2 million grant from the Department of Defense, they hope to use the development to help injured veterans. 3D printing has been around for decades, but inside a lab at the UA, the technology is being used in a new way. Scientists are 3D printing plastic bone-shaped objects, called scaffolds, that are created to replace broken bone segments. John Szievek, professor of orthopedic surgery, says the scaffolds are used with stem cells to re-grow bones. The development can benefit people who are badly injured, such as members of the military, cancer patients and car crash victims, he says. "If we could re-grow those segments for those people, for those patients, instead of them getting an amputation, it would be very, very valuable," Szievek said. The entire process is fairly quick, Szievek says. The uniquely designed scaffolds print in a matter of hours. Extracting stem cells is a fast process, too. The goal of the 3D printed scaffold is to re-grow the bone that's been lost, essentially restoring it to the way the bone was before the injury. Researchers at the UA are able to send scaffold images to hospitals or VAs across the country, so the technology can benefit people outside southern Arizona. The next step is determining if the new bone holds up like the last. "Is that bone strong enough that we can send that soldier back out to the battlefield and do their job, and be confident that there will be no problems with that bone?" Szievek said.